Residents are familiar with the large scale fundraising activities on the Second Life Grid: mustering a world-wide volunteer base on an economic virtual platform to raise thousands of dollars for such causes as the American Cancer Society's Relay for Life, Live and Learn in Kenya's "Feed a Smile," Creations Park’s work to benefit the Michael J. Fox Foundation for Parkinson's Research. Hundreds of volunteers donate time, talent, and treasure to make these virtual activities have a real world impact. Every now and again the opportunity comes along for such efforts to be personal. 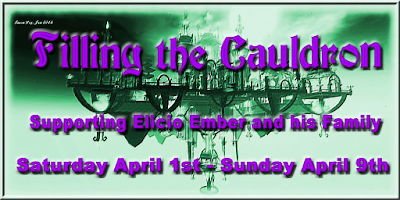 Filling the Cauldron - Saturday April 1st through Sunday, April 9th - is such an opportunity. 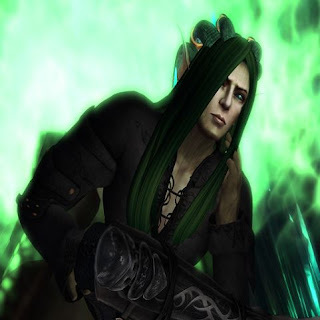 Elicio Ember is a brilliant Second Life creator and artist, known for highly imaginative plants and fantasy designs provided through his Cerridwen's Cauldron brand, and for his generous spirit and his involvement in charitable events such as Fantasy Faire. A serious stroke suffered by his father has left Elicio and his sisters with profound medical expenses. The medical situation in Mexico, where Elicio and his family reside, does not provide reasonable medical support for the care and rehabilitation that will be required. Dozens of artists, musicians, and creators who only know Elicio through his creations and generosity have banded together to fill his "Cauldron" - raising money to help Elicio and his family. Filling the Cauldron is a week-long celebration of Elicio's work in Second Life beginning this Saturday, April 1st. The nine day jubilee will feature live performances, music, over 20 vendor stalls (including Roawenwood, Ozimals, and Fallen Gods), an Art Show with the work of supportive artists as well as Elicio's own works, and both silent and live auctions of unique items contributed to the fundraising effort by their creators. Live events kick off at 9 am slt Saturday with musician Lazarus Doghouse. The Holly Kai Estate is host to all these features and more. Over half a dozen designers have created fanciful gardens using pieces from the Cerridwen's Cauldron catalogue for the Design a Garden Contest. Visitors can vote for their favorite garden creation, as well as place their votes in the Filling the Cauldron Photo Contest. Cerridwen's Corner will provide an opportunity to purchase a sampling of Elicio's creations, and to visit his main store. This amazing gathering of talent clearly pays tribute to Ember's contributions to Second Life as both artist and generous spirit, including pieces from his real world artworks available in the silent auction. "So many people have been touched by Elicio's kindness, and found joy in his art," said Inara Pey, organizer, "This is such a tremendous tribute to the many lives he has touched." "There are so many unique one-of-a-kind items to be got at this event," added Saffia Widdershins, also among the organizers, "I hope that people will take advantage of the opportunity to get some of these items and have it benefit such a wonderful person and his family when they really need the help." Filling the Cauldron officially opens at 12:00am slt on Saturday, April 1st and continues until midnight on Sunday, April 9th. Direct enquires should be forwarded to Inara Pey or Saffia Widdershins at the e-mail address above, or via notecard in-world.